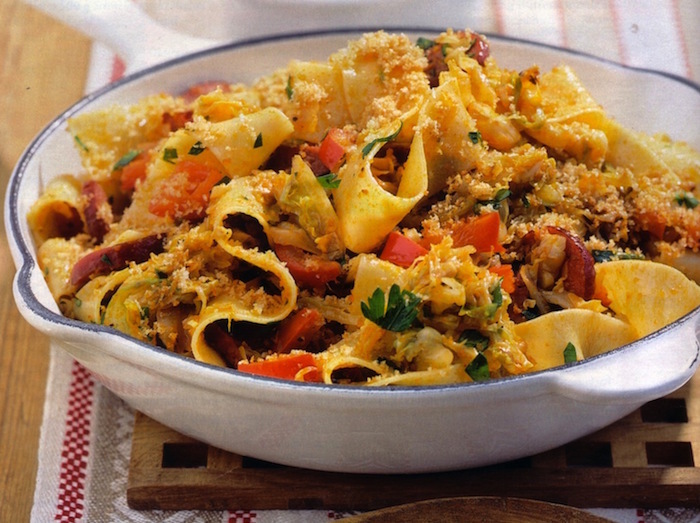 What about the Ribbon pasta fried cabbage dish for your next dinner? We like this recipe as it shows a different way to cook cabbage. It is an easy to make pasta dish with fried cabbage and contains the popular Polish cabanossi sausage. What is Cabanossi? Cabanossi (or Kabanosy) is a type of dry, thin sausage, similar to a mild salami. It is made from pork and beef, lightly seasoned and then smoked. It is a European sausage and not so easy to find in the USA. We tried to find it in Eastern European deli stores and were lucky to find them there. Alternatively you can use the Polish Kielbasa sausage. If you like spicy sausages use the American pepperoni which is similar but spicy. Cabanossi is not spicy at all. Happy Cooking! - Cut pepper in quarters, remove seeds and cut in very small cubes; quarter cabbage, remove hard parts, cut in small stripes. - Peel garlic and cut very fine: cut Cabanossi in half (vertical) and cut in thin slices. - Heat 5 tbsp olive oil in a skillet and fry cabbage for 5 minutes; add pepper and Cabanossi, fry it for another 8 minutes, stir frequently. - Spice cabbage with salt, pepper and paprika powder; fry it 1 more minute. - In a separate skillet heat 2 tbsp olive oil and roast bread crumbs until they show a golden color; chop parsley. - When pasta is done strain them and mix them while hot with the cabbage, add salt an pepper if needed. - Sprinkle bread crumbs and parsley on top.